Even this veggie-loving girl needs a good steak every now and then. Beef tenderloin fillets are what we do at home when we’re craving steak. 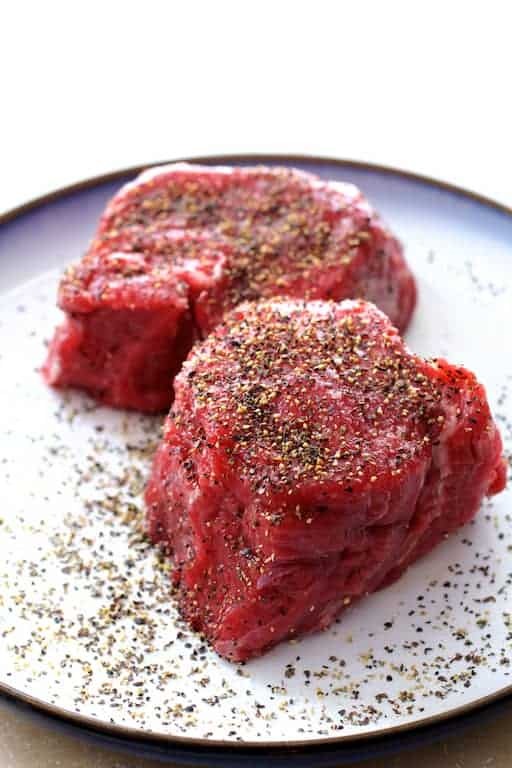 To me, the perfect filet mignon is cooked to medium doneness and is served with either a creamy horseradish sauce, a creamy cognac sauce or hearty red wine sauce. 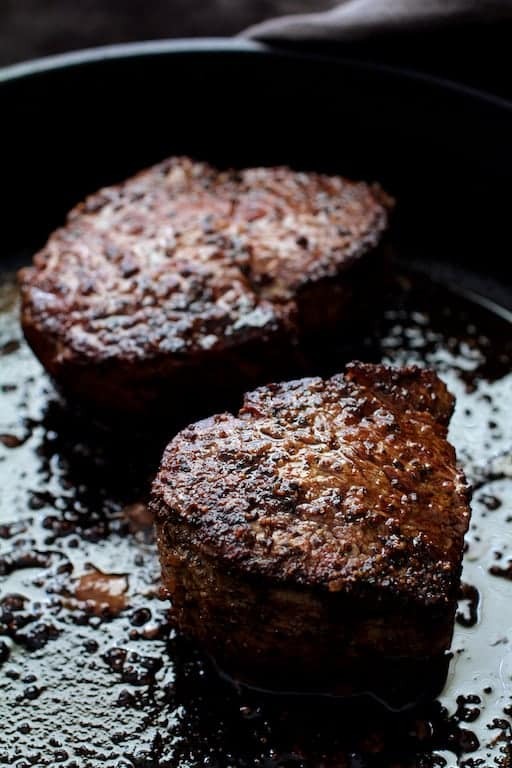 Filet mignon is a mild cut of beef so it often needs the help of a sauce. When we make it with a red wine sauce, a good blue cheese crumbled over the steak is a must! 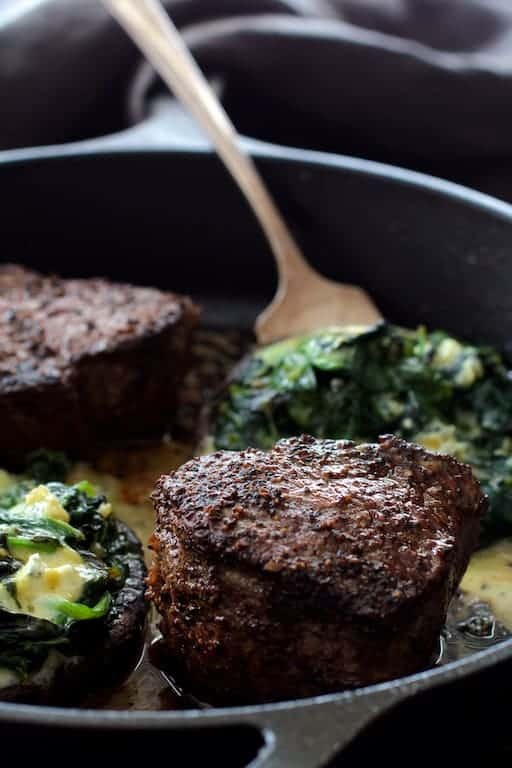 Creamed spinach is a classic side dish for steak that’s often on the menu in steakhouses. 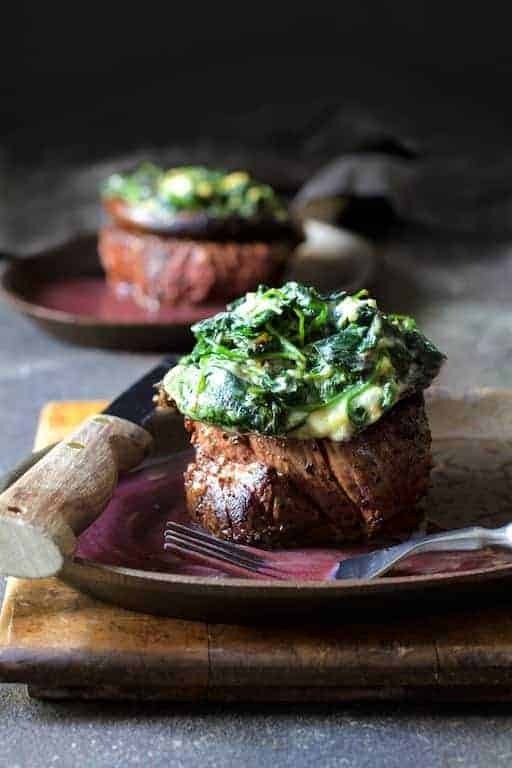 Here, that concept is stuffed into hearty, meaty-textured Portobello mushrooms served atop the steaks for all the elements that go along with a great steak. 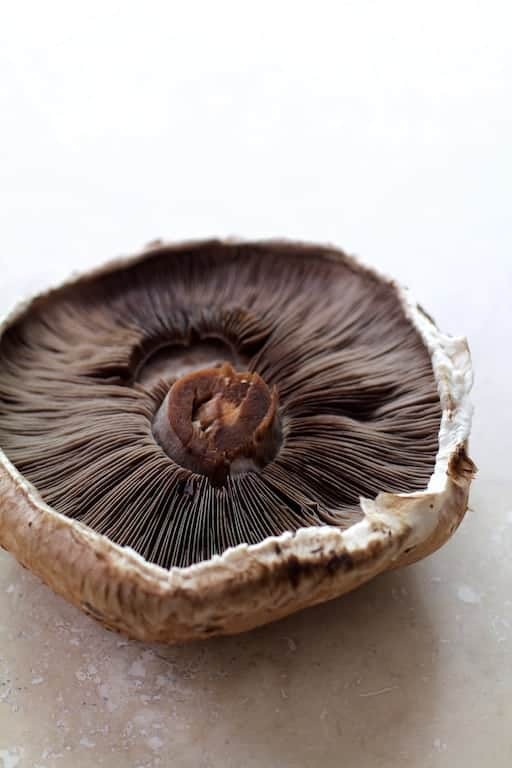 Mushrooms contain a lot of water so it’s important to bake them before filling to extract some of it. Five or six minutes in the oven is all it takes. After baking, flip them over to drain while cooking the spinach. Spinach also contains a lot of water. After the spinach is cooked, prop one side of the pan on a folded kitchen towel or on some potholders to drain that excess liquid away. Then comes the Cambozola. OMG. Cambozola is one of my favorite cheeses! It’s got the creaminess of brie or camembert, however, the “blue” flavor is fairly delicate. Often referred to as a “gateway” blue cheese, it’s perfect for people who are not big fans of blue cheese. That doesn’t describe me–I could live on blue cheese! Check out my recipe for Kale Sprout, Spinach and Arugula Gratin with Cambozola for a great side dish with roasted meat or poultry. 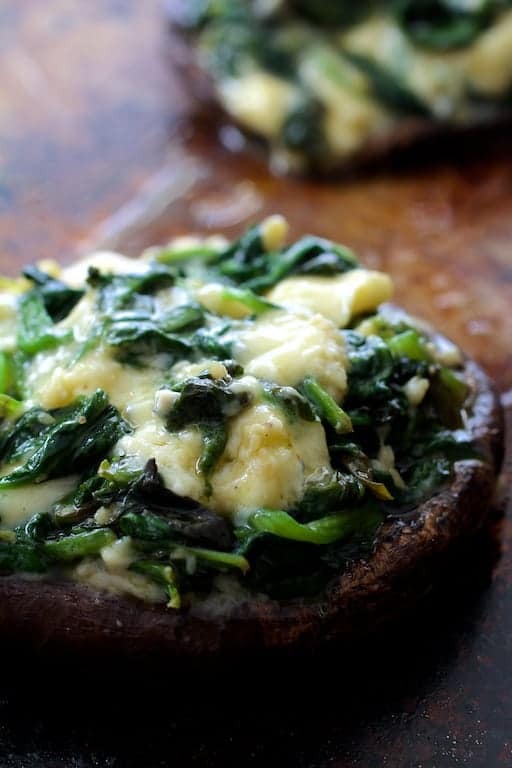 The cheese will soften and melt slightly when mixed with the spinach. The mushrooms are perfectly fine enjoyed this way. However, place them in the pan with the steaks when it’s time to finish them in the oven so the cheese gets really melty. I let beef tenderloin fillets sit at room temperature a little so they’re not too cold when they hit the pan. Serious Eats provides some information on why this is not necessary, however, I’m old-fashioned. Whether you let them sit at room temperature or not, be sure to season generously with salt and plenty of freshly cracked black pepper. 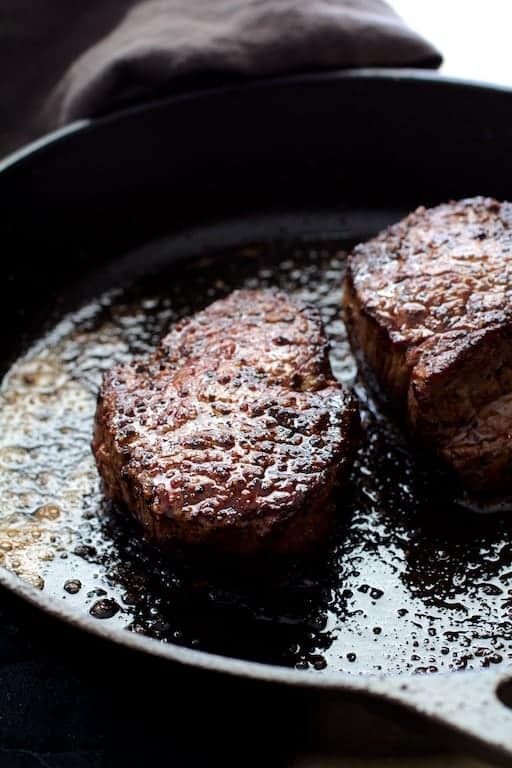 Use a good, heavy skillet such as cast iron to sear the fillets to brown them. Be careful not to turn them too quickly—give them a couple minutes per side. When you have a deep brown crust on all sides, place the stuffed mushrooms in the pan then transfer to the oven for the steaks to finish cooking to your preferred doneness. Food 52 has a quick and easy way on how to tell when your steak is done simply by using your face. With experience, it’s possible to estimate doneness simply by pressing down on the steaks. If they are soft to the touch, they’re close to rare. If they yield slightly to the touch but are beginning to feel firm they are close to medium. Firm…. well…. if you must…. The beef, the mushrooms, the cheese, the red wine sauce for the perfect bite! Betting dear old dad would love this steak for Father’s Day! Beef Tenderloin Fillets with Spinach Cambozola Stuffed Portobello Mushrooms and Red Wine Sauce is entree and side dish all in one. You might call this dish seriously "over-the-top!" Trying to figure out how to follow. What am I missing? Love all the recipes I see. Ahh, Sheila! You made my day!!!! There’s a set of social icons on the top of each page on my website. 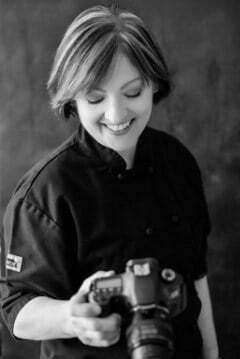 I would be ever so thrilled if you would follow me! Or, if you subscribe, I’ll send you updates each week along with some other goodies like links to some great information and a menu with shopping list! Thanks again!